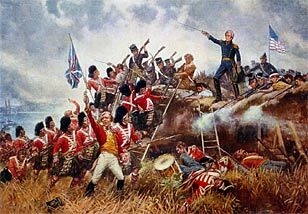 "The Battle of New Orleans," on January 9, 1815, the climactic battle in the War of 1812 and the early career of General Andrew Jackson. Painting by E. Percy Moran, © 1910. Library of Congress, Prints and Photographs Division, LC-USZC2-3796. In the turbulent year of 1812 the United States was fighting its second war with England while preparing for attacks on the Indian strongholds of the Southeast. By the end of the year, General Andrew Jackson would emerge as a new national hero. Less conspicuously, in the heart of the Seminole nation, a boy was born who would one day rise to challenge Jackson and his armies. Sources: Porter Black 1. Porter was the first and remains the only researcher to piece together the events of John Horse's life. The biographical details of this document rely heavily on Porter, and like other writings on the Black Seminoles, this work owes a great debt to his pioneering research.